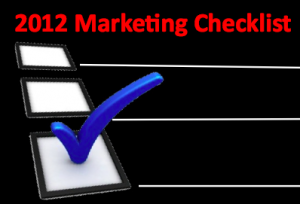 The Only 2012 Marketing Checklist You Need! To get your 2012 marketing on track to achieve your business goals, here are 111 points you need now. This 2012 Marketing Checklist is an important business tool for every marketer regardless of whether you’re working for a B2C, B2B, not-for-profit or solopreneur. Optimize your usage by taking the time to develop your answers because it’s critical to put your 2012 business plans on track! As part of this exercise, incorporate a method for tracking your progress towards your business goals at regular intervals during the year. If you find your results aren’t on track, you can make modifications as needed. How did your organization do in 2011 versus 2010? How did your organization perform versus your budget or plans for 2011? Were you monitoring results throughout the year? What were 2011’s big surprises for your business? Why were you surprised? What can you do to be better prepared going forward? Has your customer base changed during the past year? If so, look beyond the numbers to determine what’s happening with your target market? Remember–if your market’s remained consistent, it may be a sign that it’s slowing down and you may need to look for other sources of customers. Do you have channels in place to talk to customers? If so, what are they saying to you and about you? If you don’t have customer listening posts in place, do you have plans to create and use them in 2012? At a minimum, do you have real time PR/communications in place? What do your prospects and customers want from your organization in 2012? Will you be able to meet their needs? Which media formats and platforms do your prospects and customers use on a regular basis? Are they offline or online? Do you monitor these and use them for your firm’s advertising and other outreach? What do you have planned for your best customers? How do you recognize them? What do you plan to do with your worst performing customers who are no longer profitable to service? Are you planning to unmarket them? How do you show your love for your customers and your community? What trends do you see in 2012 for the economic and political environment? What impact will this have on your business? Is your organization effected by the US presidential elections? How is your firm doing relative to your competitors? Think in terms of direct and major players. Are new competitors emerging? Remember competition can come from organizations that don’t directly compete with you now but have game changing products or technology. Are the major players in the marketplace doing something that hints there’s a change in the works? Think of companies like Walmart, Amazon, Facebook and Google. Are you engaging with your peers? If not, do you plan to in 2012? Have your peers changed their business practices? If so, should you consider following suit in 2012? What are your field’s experts predicting for 2012? Do you agree with their predictions? As a result, do you need to modify your plans? What is your business’ overall vision? What is your firm’s three-year plan? Have you modified it to take into consideration the events of 2011? What are your organization’s 2012 top-level goals? How do they fit within your three-year plan and overall vision? Does your organizational focus need to be modified in light of 2011’s performance and your 2012 goals? Is your firm organized to achieve your 2012 goals? If not, how will you change to accomplish them? How are your suppliers positioned in the market? Have there been any changes among your suppliers during the past year that could affect your business? How are your distributors positioned in the market? Have there been any changes in your distribution network during the past year that could affect your business? How will your products change from 2011? What new products are you offering this year? Are there products that you’ll stop selling in 2012? What new and emerging technologies and related changes can affect your product set in 2012? Have your target audience and/or current customers’ needs changed with regard to your products? If so, does your offering require modification? Are there any product gaps based on market and/or technology changes? How will you continue to build your brand in 2012? Does your brand need to be modified in light of changes during 2011? Does your brand need to be adapted to the changing needs of your organization’s social media execution(s)? How does your branding campaign need to be modified to adapt to new media options and devices? How are you tracking your brand’s performance? Does this monitoring need to be adapted? Have you established your 2012 promotional calendar? Do you have at least one promotion per month? Does it consider all aspects of an offer? Do you have special product related events and holidays? For example, National Ice Cream Day. Is your organization’s birthday/anniversary recognized in 2012’s calendar? Is it a major event? Do you celebrate customers’ birthdays or other significant event? Have you planned special value promotions for 2012? Have you incorporated targeted promotions aimed at your top tier customers for 2012? Do you have a set of promotions for second tier customers for 2012? These are the customers you need to cultivate to grow into top tier customers. What are your major marketing strategies for 2012? Do they work to achieve your overall business goals? What’s your 2012 marketing media mix? Does it match your target audience’s media consumption habits? What’s your 2012 creative strategy? What’s your 2012 advertising strategy? What website changes or modifications are planned 2012? Is your website optimized to maximized sales? What is your email marketing strategy for 2012? Is your organization collecting customer contact information (with permission of course!) including physical address, email address and mobile phone (where appropriate)? Have you updated your organization’s search optimization strategy for 2012? Is it connected with your social media and content marketing strategies? Does it include mobile search? Are you using every customer touch point to reach your target audience, leads, prospects and customers? If not, do you have 2012 plans to improve those that aren’t effective? Do your 2012 marketing plans include the use of e-readers (Kindle), tablets ( iPads) and other portable devices where appropriate? Are you leveraging your organization’s physical presence (if you have one) to merchandise your business? Do you have a 2012 PR strategy integrated into your communications strategy? What is your corporate communications strategy? Is offline media still part of your media mix? If so, is it still yielding sufficient response? Are you planning to use direct mail or other forms of promotional marketing in 2012? Are they providing sufficient return relative to their expense? What new marketing formats are you planning to add to your 2012 plans? Are your 2012 marketing campaigns integrated across platforms? Are you maximizing your internal promotional channels for 2012? What marketing initiatives are you planning to test in 2012 and how? Does your organization have a crisis management plan in place? If you do, how often do you update it? Are you loosing prospects at specific points in the purchase process? Don’t overlook prospects who get better prices via mobile. Check this smartphone data! Do you have a mobile strategy integrated into your sales funnel? If not, this can be an issue. Do you have a set of raving fans? If so, what are you doing to build on this love? Where does your organization need content marketing? Include the full breadth of marketing and corporate communications across your organization. Do you have a 2012 editorial calendar? Does it incorporate your content marketing and social media information? Does your content marketing support the engagement phase of the purchase process? Remember this can happen across channels and involve customer service. Does your content marketing support the purchase, including follow up communications? Does your content marketing provide post-purchase support? Are you monitoring the social media ecosystem? Does your social media strategy target those platforms where your audience is? If not, establish a plan to do so. Do you have corporate social media guidelines for what employees can and can’t do when they represent your organization? Do you have an overall social media marketing strategy for 2012? Do you have a blogging strategy? Do you have members of your company involved across your organization? Are you using Facebook? If so, what’s your strategy? Are you planning to use Twitter? If so, what’s your Twitter strategy? Is it more than just a broadcast channel? Do you have dedicated social media headcount? If not, are these functions integrated into the appropriate jobs? Is your customer service engaged with your marketing department to ensure that they are aware of what’s in the pipeline? Get technical – This means 2012 technology! Is your data secure? If not, how do you plan to fix this issue? This can put your business at risk. Does your organization have sufficient technical support to achieve your 2012 goals? Do you need additional hardware, extra bandwidth, computers, and/or programmers to support your related marketing systems in 2012? Do you provide training for those staff whose jobs require they understand the process? Note: This means non-technical staff who use or interact with these systems. Does your organization have sufficient staff to achieve its 2012 goals? Are you missing specific expertise? Can this support be outsourced or do you need to hire people with these specialized skills? Does your senior management team communicate regularly with staff so that everyone’s on the same page? Are your organization’s employees motivated to achieve your organization’s goals? Do employees have 2012 goals that are aligned with your corporate goals? Does your organization publically recognize employees? Does this help morale? Is your organization at risk of loosing key executives or staff in 2012? If so, what’s your plan to keep them? Have you planned local and community activities for 2012? How will your business give back to the community 2012? Cone Inc. Research shows customers support firms that support not-for-profit causes. What metrics do you plan to use in 2012 to track your progress towards your goals based on your marketing plan? At a minimum, consider marketing metrics, social media marketing metrics, content marketing metrics. Are you tracking sentiment and branding impact that are more complex to assess? Here’s a list of branding metrics. Do your KPIs need to be modified to achieve your 2012 goals? How are you tracking revenues and costs for 2012? Have you incorporated the interim steps towards sales? How’s your organization’s 2012 cash flow? Do you know how much money you have coming in and going out? What other marketing elements would you add to this list? Please include your suggestions in the comments section below along with your rationale for adding it. This title comes from 21 New Years Titles Guaranteed to Pull Readers In. Tags 2012 marketing checklist. Bookmark the permalink. Excellent list Heidi; I’ve gone ahead and bookmarked this! Just one little technical thing I wanted to point out — you may want to add a Google + button to the bottom of your articles…especially longer ones like these. I got to the end of the article, I saw no button, and I immediately opened a new tab to open Google + (to add the link manually); but then I thought to scroll to the top. Voila…there it was!